Hoboken is among the NJ cities planning community microgrids. New Jersey has kicked off a plan to incentivize community microgrids with $1 million in funds for feasibility studies. The Board of Public Utilities (BPU) is circulating a draft application to be used in the competition. The board seeks stakeholder input on the application by August 30. New Jersey has mapped 24 communities in 17 municipalities hard hit by Superstorm Sandy that could benefit from the microgrids. The BPU will offer up to $200,000 per feasibility study for 5-10 community microgrids. The state expects to issue a second round of funds for engineering work at a later date. The budget for that part of the program has yet to be approved. By definition community microgrids serve critical facilities, such as hospitals, police and emergency shelters. In this case the microgrids will serve clustered critical facilities in a small radius, generally no more than a mile, within what the state calls town centers. Community members could go to the town centers for shelter and services during a storm or power outage. To be eligible for the study funds, the microgrids must be able to operate in both grid-connected and island mode in a cost-effective manner, connecting multiple customers across multiple rights-of-way. The draft application requires that a government entity serve as lead applicant. The project also must have the support of the local utility to be eligible for the funds. The BPU worked with the New Jersey Institute of Technology (NJIT) to map the storm-vulnerable communities in need of microgrids. The state sought out low to moderate income communities with important public buildings and an anchor critical facility, such as a waste water treatment plant. Buildings were evaluated for both their electric and heat requirements, paving the way for combined heat and power units to be included as part of the microgrids. The town centers are within nine areas heavily affected by Superstorm Sandy. 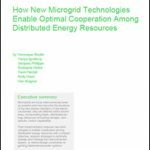 The NJIT report noted, however, that the value of distributed generation within microgrids goes beyond serving communities during a crisis. The New Jersey program stems from the state’s 2015 Energy Master Plan that calls for installation of more microgrids to improve grid resiliency in storms. New Jersey was one of the hardest hit among the 20 states affected by Superstorm Sandy, with 2.6 million outages. The state already has about 45 microgrids, but most are campus microgrids or single building microgrids with a one type of distributed energy resource, according the BPU. 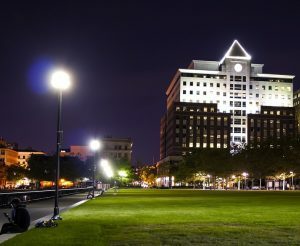 New Jersey also is home to Princeton University’s sophisticated microgrid, often held as an industry model. Princeton’s microgrid serves the campus both in a crisis and on a normal day-to-day basis, and acts as a resource for the central grid with sale of services into the PJM wholesale market. 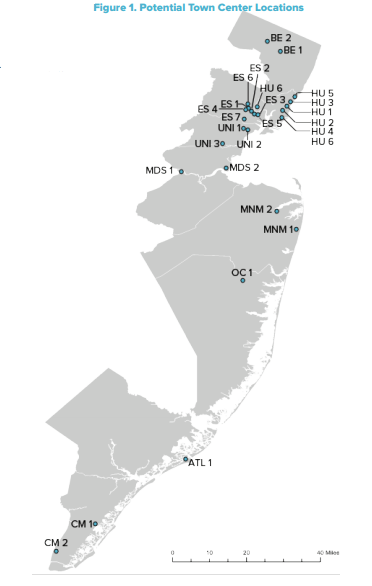 Since Superstorm Sandy, New Jersey has worked to develop microgrids on more than one front. In addition to the community microgrid plan, the state is working with the U.S. Department of Energy on a microgrid to serve the northeast portion of the state’s transit system. The DOE also is assisting with a microgrid under development in the city of Hoboken. New Jersey joins several other states that have offered seed money to kick-off microgrid development, including California, Connecticut, Massachusetts and New York. The NY Prize is the most prominent among them with $40 million available in funds. That first phase of that competition resulted in 83 projects that received $100,000 each for feasibility studies. The NY Prize is now soliciting applications for the second phase of the competition, which offers $1 million for eight demonstration studies. The NJ BPU plans to hold a meeting on its community microgrid application from 10 a.m. to noon (ET), August 23 at its offices in Trenton. Stakeholders also may participate by conference call at 877.873.8018, access code 8722756. The state is accepting written comments on the draft application, submitted to TCDERmicrogrid@bpu.nj.gov, through August 30, 2016. A copy of the draft application is available here.